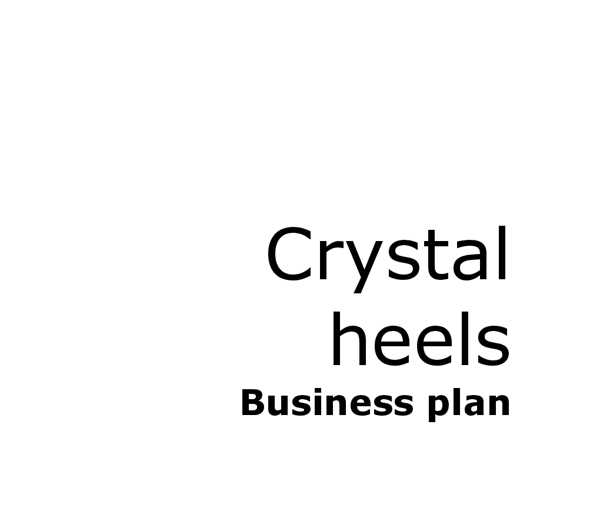 ﻿Crystal heels Business plan Completed: (insert date) Table of Contents business profile market analysis business location opertational plan human resources financial plan THE BUSINESS IDEA Description Crystal heel business idea is all about finding a practical solution to wearing high heels in rough areas by ensuring women?s heels are always protected from damages, scratches and peeling due to being wedged into uneven surfaces such as grass, wooden pathways etc. Our little supporters come in different sizes and colors, it can also be designed or custom made to match the heels. The heel supporter is made from rubber, which makes it durable and long lasting at the same time the rubber supporter is environmentally friendly made from recycled materials, which makes it easy to dispose of when consumer decides to change to a new heel, the rubber can be easily recycled. Every women or young adult who suffers from this problem, can now enjoy wearing heels without the worries of damaging their shoes. This invention aims to provide support for the heels and protects it from unneeded damages. Needs analysis Our invention is the first of its kind and unique in world for all women who wear high heels and worry about damaging their heels. Many women struggle with the public embarrassment of having their heels wedged in uneven surfaces. ...read more. Women prefer the product to be in a certain color, as 64% would like the color to match the heel, 4% would like blue, 4% would like green and 24% would like black. 44% considered the material of the product to be made from rubber and finally 48% of women preferred the product to cover quarter of the heel. (Talk about Internet research) The competition A major advantage to this business is the lack of competition, which gives it a monopoly power, which will allow the business idea to expand very quickly in the market place given that this business is one of kind and a new invention on the market. Promoting the business Price In essence the service will be selling itself with the support of friendly staff. Our services have been priced according to the survey conducted showing that women prefer the product to be sold at a price between 40-80 AED. Therefore as a team we decided that the supporter would be sold at 50 AED each 2 pieces. For any exchanges or refunds of the product provided the following conditions are met: 1. The product is exchanged or returned with 7 days form the date of purchase 2. The product is sealed and in its original condition. 3. The product s accompanied by the original receipt The cost has been established to gain more demands, as the price covers the expenses of ...read more. All profits will be split equally between the owners. Crystal heel will be open from 10:00 am to 7:00pm, so in total the business will be operating 9 hours daily within the weekdays (6 days) except Fridays, which is a day off. Crystal heel will initially employ two qualified sale staff; the first will work from 10:00am to 2:30 am, the second will take the shift from 2:30 pm to 7:00pm. Staff only allowed taking 30 minutes break to eat or use the toilet; therefore while they are away the booth must be closed to prevent unneeded theft and damages. Crystal heels offers products to its customer on a job production basis. The supplier is AAlmir Plastic Industries LLC. This company has been catering to the plastic manufacturing requirements of many small and large companies. AAlmir is offering us with an excellent price to manufacture our support, they are willing to charge us with 10 AED for each pair, this includes with the color needed and size of heel. The advantage of choosing this company as our supplier is the price they offered and the location of the company, which is 14 minutes away from the warehouse and Sharjah co-operation. This way it makes it easier to get access and less transportation expenses. The quality of the operation of crystal heel can be affected by factors such as? To ensure that quality remains stable, crystal heel will... HUMAN RESOURCES FINANCIALS ...read more. Thus, Trung Nguyen's outlets are opened late until midnight like other coffeehouses in Korea. o Order can be taken online through website, thus enhancing our e-commerce activities. o Logistic: consignments are sent by sea route. General purpose 20 feet containers are used. The result was good even if some people still prefer their traditional dish. 25 people said that the restaurant that they visited serves the food at the right time. By this, we must have a good service to our customers. When someone intends to start up a new business, there are various legal and financial factors to consider. These legal and financial factors have various implications and can have a big impact on the kind of business it is, how it operates and ultimately, its success. information, and the customer adviser will offer a very good customer service. Orange website also offers a good customer service with several links which will answer all the customers' doubts such as use of the mobile abroad, e-mail services and how to set a wireless connection (broadband services). This would affect their aims and objectives in many ways, for example: their objective to increase market share would be greatly hindered. This is because the competition is offering better products which the customer wants to buy and therefore there share of the market will go down. However, in my business the marketing objectives will apply to all members of staff as Fabulous Frostings is only small. By setting marketing objectives, I aim to provide motivation for my sister and I along with any other staff which we may employ in the future; the objectives will provide a common goal and help maintain focus.